Jersey has conceded that the impact of FATCA on Europe means that it now seems inevitable that the European Union Savings Tax Directive will be reformed and that it will have to comply with the massively increased information exchange that will put into place. Semeta: “Austria cannot submit account information to the U.S. and refuse to submit account information to the EU member countries. As a result, there is no reason why Austria and Luxembourg are blocking the directive.” The Commissioner points out that the Commission will not hesitate to file a complaint against Austria in that case. I was made party to an interesting analysis which I find is worth discussing. As you know, there are two types of model inter-governmental agreements that the US government has put forward to its FATCA treaty partners: In one model (IGA1), the treaty partner’s government collects data from financial institutions in its jurisdictions and passes it to the IRS. In the other model (IGA2), the treaty partners’ banks register with the IRS and pass the data directly. The difference is crucial because in IGA2 there is no automatic exchange of information at the government level. The treaty partner’s government directs the banks to register with the IRS and enables them (for instance by waiving domestic privacy laws) to comply with FATCA requirements. The ultimate decision to exchange information sits with the bank and not with the treaty partner’s government. 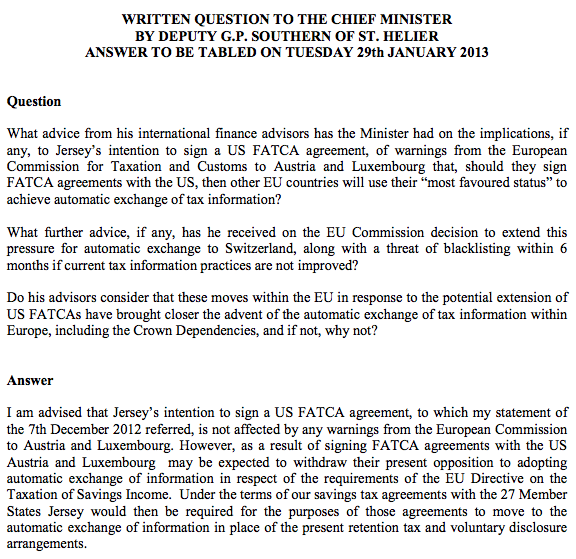 Indications are that Luxembourg (and Switzerland) are negotiating their FATCA agreements on the basis of IGA2. It is therefore entirely conceivable that, under the most favored nation clause, Luxembourg would agree to enable its financial institutions to report information to other EU member states’ authorities, but would refuse to force them to do so. Remember that the real stick of FATCA is the threat of a 30% withholding tax on all US Dollar transactions entered by non-complying institutions; this is a threat that EU member states cannot make against Luxembourg. It looks like there is much more to this most favored nation clause than meets the eye at first reading. There must be an army of lawyers at work in Vienna and Luxembourg to make sure that these two nations’ position is protected.